The French have a lovely expression for the time of day when the sun slips low on the horizon and dapples the landscape - l'heure bleue - the blue hour. Recently a group of family and friends visited Butchart Gardens in the evening. Each Saturday night during the summer months, a fireworks display, set to music, delights tourists and locals alike. Before the fireworks, people spread their blankets on the lawn, then leave them to wander through the gardens. Of course, I took photos, then walked fast to catch up with the rest. The fountain is always fun to watch as the sprays of water sway, rise and fall. Artful lighting comes on just before dusk, giving plants an other-worldly look, like these astilbe. As the days shorten, almost imperceptibly, each week the time for the fireworks show is just a bit earlier. The image of blues in my garden was taken in late afternoon, not twilight. The shadows lengthen but the sun is still hot. I'm linking this post to Mosaic Monday, hosted by Mary of the Little Red House. 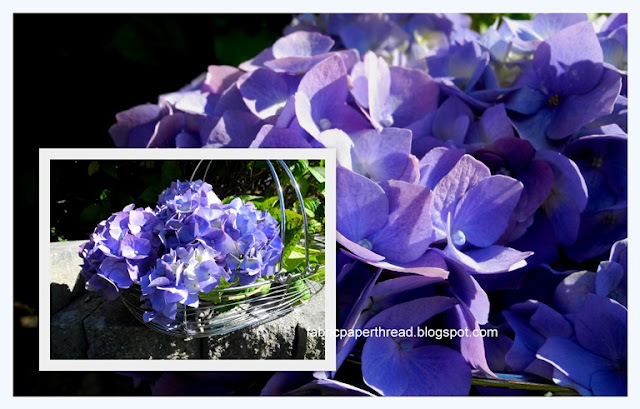 Beautiful photos again -- love the hydrangea close ups. Amazing someone would steal your photos and repost them. What an evening! Just wonderful. I am very fond of the blue hour, especially so in winter. That astilbe is quite incredible. I have pink and burgundy and neither look as lovely as that. It's one of my favorite perennials. Beautiful pictures. So sorry about the photo hijacking. Some people work hard at doing the wrong thing and using the work of others and taking credit is wrong. Sounds wonderful, Lorrie! Exquisite photos, and your hydrangea is gorgeous. I was sorry to hear about your photos being stolen. I've oft wondered about protecting my own, not that I've used too many of late. Beautiful. That is so wrong for people to steal photos and post them as their own. I love the feathery pink astilbe your photographed, Lorrie. The blue hour is so magical! I know how disheartening it is to have photos stolen -- it has also happened to me. One girl recently used a photo I took for her wedding website invitation! I usually will give permission if someone wants to use a photo--all I ask is that they give my blog credit for it and link back. I probably should also watermark but I find it time consuming to do. I've seen the fountain shoot up in all it's glory but didn't get the chance to experience the fireworks, I've heard that they are wonderful. How dreadful that someone would steal your images and pass them off as their own, well done for tackling them and having them removed. I've often thought about watermarking my own images but haven't a clue how to do it. Beautiful photos of the Butchart Gardens, I've always enjoyed visiting there! These are beautiful photos Lorrie, and I think it would be magical to see the Gardens fireworks. I'm sorry you had some of your photos 'taken' like that. It's happened to a lot of bloggers and I always watermark mine, although that can easily be removed with today's technology. I just don't get 'it' either. What's the point of them doing it. I hope you have a wonderful week. How beautiful! I love that astilbe. We are planning our evening at Butchart for this coming Saturday, so I hope the good weather holds. About two years ago, I discover that many of my posts had been copied as posts on another blog. A bit of research taught me that this practice of "blog-scraping" was probably done robotically, the content used to generate clicks to get exposure for advertising that Google pays for . . . And believe me, Blogger/google was little help in having these removed. I had to fill in and submit forms electronically for each single post whereas I would have assumed and hoped that the whole blog would immediately be shut down for obvious theft. Glad you were able to obtain faster results. It was fortunate that your friend found out about the thief and that you were able to get the photos removed. I often wonder about this nasty business. Mater had something similar happen but I think it was her entire blog content. Someone pretending that she was living her life. Weird if you ask me because everyone has something so personal and unique to share. Beautiful...your photos! So sorry that you had your photos hi-jacked. I have found one of my photos on a stranger's website as well...but decided not to watermark my pictures. I always find my eyes going right to the text rather than the image...if the photos are watermarked. Well dear Lorrie your photos are beautiful enough to steal but of course none of us want that happening. Interesting what Vee said, and amazing that there are nut cases who want to live someone else's life! I'm not bothering with the watermark thing - It spoils the overall image of the photo really and now that Vee says those nasty people can always remove it I'm not doing it. Interesting about the fireworks evenings at Butchart - again, I must return to walk with you and H and enjoy an evening there - as long as there are no mozzies! Are there? I'm so allergic to mosquito bites! What fabulous photos - the astilbe is magnificent. I've decided against watermarking my photos - anyone with just a little bit of computer skill can easily remove them - or crop them off - if they are interested in stealing they will find a way. I had to deal with a tea company- name Honest Tea - yeah right. They emailed me and asked to buy one of my photos for their labels - well, they wanted to pay 5.00 for it - and I know advertising photos cost more than that - and we never agreed on a price. Then, out of curiosity I went to their website and there was my photo - on their labels. I notified them that my attorney had assured me that I was to receive a hefty percentage of the profits from every bottle of that iced tea that was sold - and all of a sudden they could come up with the money that I had asked for to buy my photo. Amazing how that works. And the name - Honest Tea - I'll never buy that brand - ever. Your photos are worthy of theft but I agree with you, why would someone want to do it? Buchard garden was THE garden tour that set me on a lifelong garden touring passion! Victoria Island has so many wonderful public gardens that make for giddy fun over a weekend. I have found my photos pinned with the URL included. I felt flattered. It would bug me if someone claimed they took the photo; I am quite happy if others share them with credit given. I figure I was just documenting the work of The Artist anyway. There is a website dedicated to the blue hour a blogger friend told me about once. It even helps you find the hour for your particular location. I don't remember how/where I marked it right now. It's very interesting and lends to gorgeous photos. Beautiful garden photos Lorrie--especially love the hydrangea and astilbe! Years later I still go back and forth about whether to watermark or not - partly for the reason stated by the comment above me. Sorry about the use of your photos. Of course on the net we have not control over who uses our photos, a chance we have to take, but to use them with their own link not good. Sorry to hear your photos were taken. A friend at the blog, Paris Parfait, has been writing alot about this lately. It's worth a read. Love Butchart Gardens and once long, long ago I enjoyed the fireworks there. Gosh, you are so lucky to live close and see the amazing gardens there throughout the seasons. Your photo of the astilbe is exquisite! It is dreadful when some one steals your photos. I put a watermark on mine to at least slow any potential thieves down or make them think twice. I'm sure that folks have swiped them nonetheless. Shame on them! oh what a beautiful garden - delightful. Thanks for taking us along. Blue hour photos is the topic for my photography group this month, this Thursday. It will be interesting to see what people produce. Mine is that Singapore skyline photo you so kindly commented on yesterday. Have a wonderful week and thanks for stopping by my blog. Yes it is a worry when you know that your images and words can be plucked from the web and used somewhere else - you would never know would you? Your photos are gorgeous! I'm gobstruck that someone watermarked your photos!! That's just horrible to me. That is one membership that has paid off in great dividends. So worth it. I have noticed so many bloggers using photos from sources like Pinterest, or the internet, and not crediting the source, not asking permission, just taking..it rather bothers me. You should watermark, and add meta data to your lovely shots, and anyone wanting to use them should ask permission of you. Get a creative commons tag on your sidebar also, at least it tells readers what they can use, or not use. Beautiful shots Lorrie! and thanks for the tip on watermarking our photos. Darrell and I visited Butchart Gardens on our honeymoon,,,,27 years ago! I think it may be time to return!! Have a great day Lorrie! It has been way too many years since we've been to this beautiful spot. Thanks for the wonderful pictures and the memories. I love the gardens. I wish mine could look like that but no matter how untidy a garden is, it has its own magic. Formal gardens are beautiful though and show the care put into them.